While most of the visitors to Tile Shower DIY are looking for helpful information and inspiration for some kind of custom tile shower renovation or upgrade projects, many others – perhaps you! – are in search of insight on how to improve the level of convenience in their bathroom. You could be making your bathroom handicapped accessible for someone in the family. …You could be proactively thinking about the future of your home as you age, or for increased resale value. …Or you could simply want a more inviting, relaxing, and enjoyable bathroom atmosphere. Wouldn’t it be great to have your bathroom faucet turn on and off automatically with a motion sensor, like they do in public restrooms? …But also be able to have one that looks stylish and classy for the home environment? Well, the technology is no longer only available in commercial grade, less attractive, models. Many companies are now providing Touchless residential faucets. Not only are the more hygienic, but not being handled as much they won’t need cleaned nearly as often! See touchless bathroom faucets available like this one on Amazon. Seating can come in very handy in a shower, which many people prefer today over baths. You can easily add a bench, without having to tear out your shower and build a new one from scratch. From plastic chairs/benches you can remove from the shower, to wall mount fold up benches, you’ll find a ton of options available today. They don’t have to take up much of your limited shower space either….There are many attractive choices available, like the seat below that folds up against the wall when not being used. 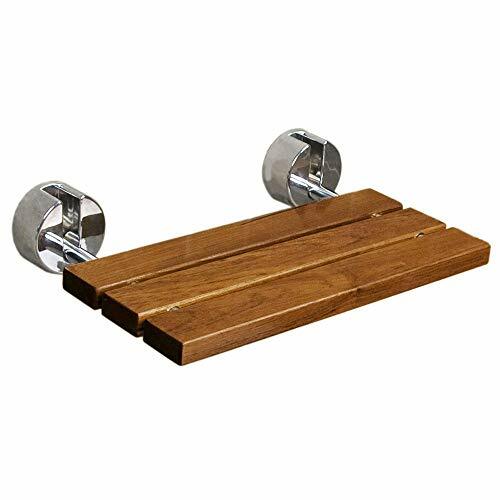 See more details and customer reviews on this 20″ wide Teak Modern Folding Shower Bench here on Amazon If you click this link and make a purchase, we earn a commission at no additional cost to you. . 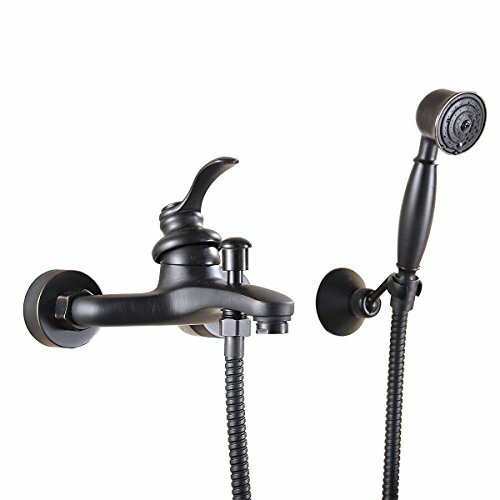 Whether for reaching places the overhead shower head won’t reach, washing the family dog, rinsing your feet, or for easier showering if you’re handicapped, anyone can see the benefit and convenience of having a handheld shower wand to go along with your tub spout and overhead shower head. You can click here to see our thorough review of the Best Combination Shower Head & Handheld Wands available on the market. You can find this beautiful Greenspring Oil Rubbed Bronze Tub Spout & Handheld Shower Wand here on Amazon If you click this link and make a purchase, we earn a commission at no additional cost to you. . 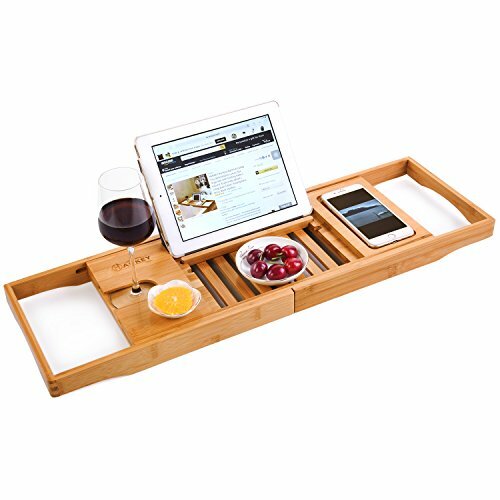 If you’re a bath connoisseur who enjoys the luxurious, relaxing time in a bubble bath, a tray caddy can improve your experience, giving you a convenient place to store a drink, entertainment or reading material, without having to balance it on the side of the tub, or reaching over to place it on the floor. Find this Bamboo Bathtub Caddy here on Amazon. Click to see details, price, and reviews! If you click this link and make a purchase, we earn a commission at no additional cost to you. Tired of having shampoo bottles and other shower supplies balanced precariously around the edge of the tub? If you have multiple people in the family using one tub & shower, it can get out of hand with how many bath products are in there. 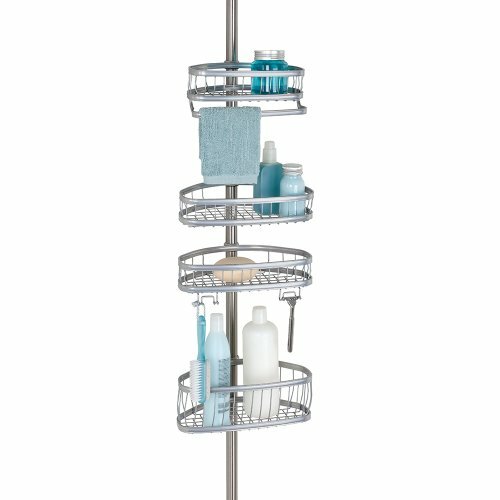 Without having to tear out the shower to build shelves in the wall, you can add a lot of space and organization to your shower simply by adding a shower caddy “tower” or “tiered shelves” to the corners of the shower… like the one to the right. Or, you can find many highly-rated models that hang from the shower head arm. You can find the bronze shower caddy tower to the right, and many others like it, here on Amazon If you click this link and make a purchase, we earn a commission at no additional cost to you. . Grab bars are very helpful for elderly and handicapped, but they don’t have to be ugly. Manufacturers offer many attractive options today. We spend a lot of time in our bathrooms, so we deserve to make it as enjoyable experience as possible. Invest in some of these items listed, and you’ll be glad you did!